This drug is the most powerful of all medications on the market. The active ingredient, which is included in the drug - oximetalona that has a high anabolic activity. The drug has a significant effect androgen in the body. In the case of proper use of the medication, as planned, you can get up to 7 kg of muscle in 14 days. Oximetalona, the active ingredient in the drug, was created in the sixties of the last century as a cure for anemia and osteoporosis, as well as to stimulate the growth of muscle tissue. Athletes who take these pills point to an improvement in the mobility of the joints. Modern research has shown that they have a positive effect in the treatment of HIV. 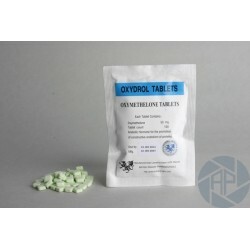 Beginners take Oxydrol, the guide will tell you about the composition of the drug and its properties, but won't provide general recommendations for their effective implementation. If you are not familiar with the product and don't know how to take it, we must not search its intuition; you should consult with a specialist, attending the Forum and knows how to achieve positive results without side effects. This steroid is earned the recognition as one of the stimulating more active, the growth muscle and the force. Coupled correctly and the correct execution of a pill for the course, an increase in muscle mass can be achieved up to 12-15 kg. However, after the end of the course, there is a significant "reduction," up to 30% reached growth. Largely due to a significant accumulation of water in the body in the course of preparation. Steroids last 4-6 weeks. It is not only useless for growth indicators, but also detrimental to health: maximum effect occurs in the first three weeks after receipt, and your more than 1.5 months continued use can cause serious liver problems. Therefore, if you have not reached completed expected results of taking the pills, it is not necessary to make the course longer, it is best to go to soft drugs. Root must take 50 mg per day, and towards the end of the first week of the course of the daily dose can be increased to 100 mg, and in the future, when an athlete achieves high results, you can try increasing the dose to 150 mg. Due to the high estrogenic activity and toxicity of the liver include Oxydrol in the course of an intensive muscle contracting is not recommended for younger men of 21 years. Bodybuilders doses for people from 50 to 150 mg per day. Recommended for women of taking the drug to an oximetalona dose of 50 mg per day to avoid virilization. Laoximetolona daily dose of 150 mg of the drug increased does not further improve outcomes but increases the percentage likelihood of side effects. To restore the body's testosterone production, having finished Oxydrol, the course is accompanied by taking drivers of testosterone during 3 - 4 weeks and antiestrogens. Because the drug contributes to the accumulation of fluid, the oxydrol course provides a significant weight gain, but the mass of Aguada, the next stage of the preparation for a competition in bodybuilding will need to work hard on quality muscle. Speed Dial muscle mass contributes to a combination of the drug nandrolone decanoate. To preserve muscle mass drug is used in conjunction with the means of injection, in particular with Sustanon or testosterone enanthate. The traditional combination of these tablets Sustanon + trenbolone gives better growth and a robust increase in the production of muscle strength. The reception is also recommended to athletes who suffer from diseases of the joints. The correct response to the drug in the course contributes to the accumulation of fluid in the body as a whole, in particular, increases the amount of natural lubrication for the joints. This anabolic as any steroid, in a consistent application, contributes to the rapid progress of its sports performance. However, if it is wrong to accept it, the side effects can cause significant damage to health. Firstly, it is contraindicated in acute renal and hepatic failure, prostate cancer, the increase in sensitivity to the oxymetholone. No, women can take pills to with breast cancer, as well as during pregnancy and lactation (breastfeeding).